Wrap your sweetheart in a warm love embrace this Valentines Day with our super fun long stem rainbow roses and cute, cuddly love bear. 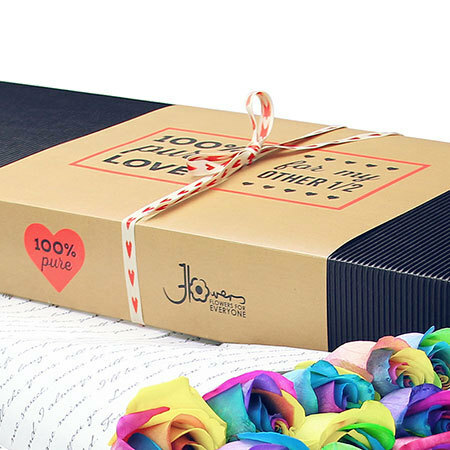 Send two dozen vibrantly coloured rainbow roses presented in our stylish rose box, nestled in folds of Flowers for Everyone signature lyrical print tissue paper (wrapped in the words of Elvis Presley`s `Love Me Tender`, now that`s romantic!). Accompanying your 60cm long rose stems is an adorable 25cm teddy bear. - the perfect combination for romance and cuddles on Valentines Day! Plus deliver two dozen roses with a teddy bear and receive a FREE fragrant Ecoya candle worth $19.95, just to add an extra touch of romance. Our Valentines Day roses, free Ecoya candle, teddy bear and unique packaging are exclusive to flower delivery in the SYDNEY MELBOURNE & PERTH Metro Region ONLY. 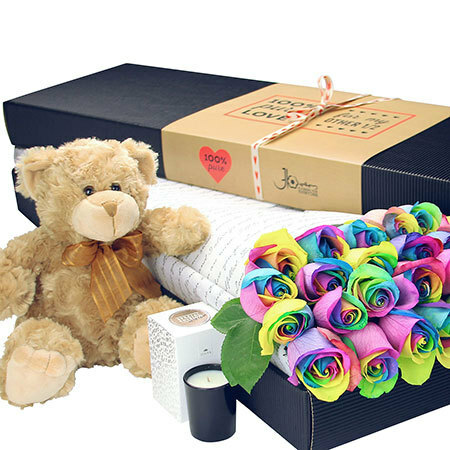 Order your long stem rainbow roses and teddy bear now for Valentines Day via this online florist store, email our fabulous love cupid floral consultants at sales@flowersforeveryone.com.au or give us a call on 1800 66 66 46.